It’s the middle of Summer and by now, either you are engrossed in baseball or you are not. This year, I am not, which may mean that I am not a true fan. I will watch more games when we get closer to the end of the MLB season and in post season, but till then, I will catch a game when it works out. Years ago, back when I was in High School, I was playing baseball several days each week, and was following baseball each week when I could and when the stats were updated in the Sunday paper. At one time, I knew most every player on every team and watched the battle for the best ERA, home runs, and batting average. If you watch much baseball, you realize most every player gets out more often then they get a hit, so it is basically a battle to see who the best loser is, which usually makes them a winner for the season. 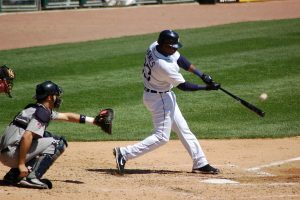 What do you consider a good batting average at work, in relationships, and other areas of life? Have the majority of the past 10 interactions with family members been positive or negative in nature? Have most of the past few projects you have worked on gone well? We can look at how things go in our day to day lives and often start to see patterns of good and bad habits. Often, others can see these things before we can and may even say, you don’t seem like yourself, or you appear to be in a slump. I may have a streak of days that seem less productive than I would like and start to ask ‘why’. I’m sure baseball players do the same when they are in a slump, and may need to change something about the way they are hitting or pitching. I may have picked up some bad habits, or need to change something about the way my daily routines of eating, sleeping, and how I use my time are going. Who knows you best and can help you figure out what to change to get out of your slumps? A friend I have known for over 10 years, but haven’t really talked with in over 5 years, recently reached out to me and started asking questions on how he could grow closer with God. I don’t know a lot about what has gone on in his live over the past several years, so I was basically asking more questions of him than giving answers. I also suggested talking in person or on the phone as a better way to correspond than by messages, but am still waiting for him to find a time that works. I truly enjoy opportunities like this to talk about faith with anyone, but making time to delve into deeper questions is almost essential to get to the root of the issues we may have. How often do you get to share your faith or discuss spiritual issues with believers or non-believers? Would you consider these interactions successful? I wonder if the disciples thought that Jesus failed or succeeded at His mission when He went to the cross. Based on the comments in Scripture, it appears they were looking for a different outcome. One of the few who recognized the gravity of the situation was another man dying next to him on the cross. It wasn’t until they realized that Jesus had risen from the dead that they realized He had hit a homerun and was a game-changer not just for them, but for everyone. Has His death and resurrection changed the game for you? If you are in a spiritual slump, what things have worked previously to help you grow closer to God? Make a list of three things that have worked in the past and make a concerted effort to do these few things for the next three weeks. For me, those things are (1) consistent prayer, (2) time to read both scripture and other things that are edifying, and (3) time to talk with others about meaningful things. May your batting average and enjoyment of the ‘game’ improve as you do what it takes to be your best in all areas of life.